How Old is this M1 Garand Part? If you're doing a Garand "build", as opposed to a restoration of a complete gun, you will probably get a kit of parts instead of buying everything individually. The collection of parts in the kit probably didn't come from one original rifle. Even if it did, that rifle had probably been through at least one armory refurbishment. The M1 Garand was the standard service rifle from 1936 through 1957. The result is that the parts kit represents a wide range of places and dates of manufacturing. 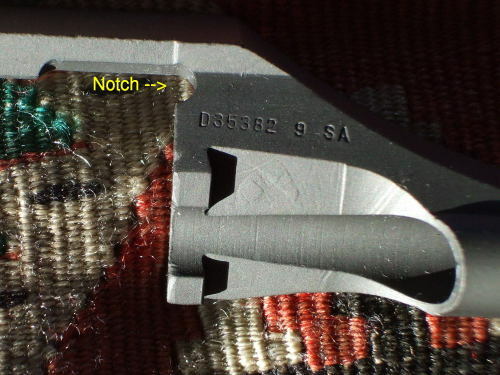 However, it is possible to figure out when and where Garand parts were manufactured, at least within ranges of time. This is a brief overview. Click here for a far more detailed history. John C Garand worked at the US Army's Springfield Armory and designed a series of closely related rifles through the 1920s and early 1930s. These were evaluated in trials to replace the M1903 Springfield bolt-action rifle with a self-loading design. He designed the T1E2 in 1932. In August 1933 the T1E2 was designated the Semi-Automatic Rifle, Caliber .30, M1. In 1936 the M1 Garand replaced the M1903 Springfield as the standard service rifle, the M1903 remaining in use as a sniper weapon. 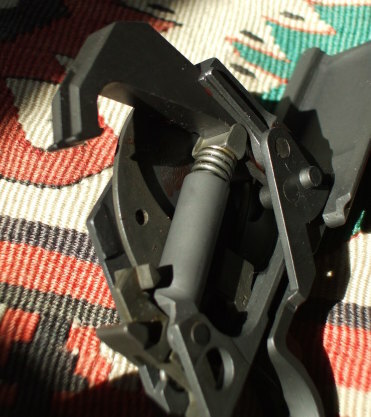 In 1939 the original gas trap was replaced with a simpler and more reliable gas port system. 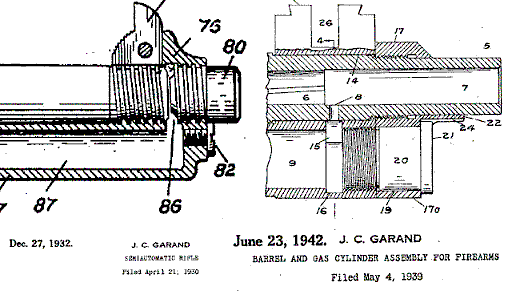 The patent drawings for the gas trap and gas port are seen at left and right, respectively. A little over 5,500,000 M1 Garands were manufactured during the years 1936 through 1957 when it was the standard service rifle. A little over 4 million were manufactured before and during World War II, by the federal armory in Springfield, Massachusetts, and by Harrington & Richardson and International Harvester. During the Korean War, the same manufacturers produced roughly another 1.5 million Garands. Note that the Springfield Armory, now a National Historic Site, operated from 1794 through 1968. However, Springfield Armory, Inc., based in Geneseo, Illinois, simply uses the "Springfield Armory" name and has no connection with the national armory. When the armory closed in 1968, a small company in Texas used the name for a few years. That business was unsuccessful, and then in 1974, the Illinois company was founded. The M1 remained the standard service rifle of the U.S. until the M14 was officially adopted in 1957. However, the changeover from M1 to M14 in the active-duty component of the U.S. Army was not completed until 1963, and it was used in the U.S. Army Reserve, U.S. Army National Guard and U.S. Navy at least into the 1970s. Among several other nations using it, it was the standard service rifle in Greece until the late 1970s. And, Haiti's military used the M1 until their national military was disbanded in 1994. The M1 Garand is still in use in the Philippines in the Civilian Auxiliary Forces Geographical Unit (CAFGU) and the Civilian Volunteer Organization. I used The M1 Garand, 1936-1957 by Joe Poyer and Craig Riesch as a reference (4th edition, ISBN 1-882391-19-5, North Cape Publications, Tustin CA, copyrights 1995, 1997, 2001, 2005). I am skeptical of the book's accuracy. It is based on specifications in the public domain and it is on its fourth edition, but obvious errors still remain. 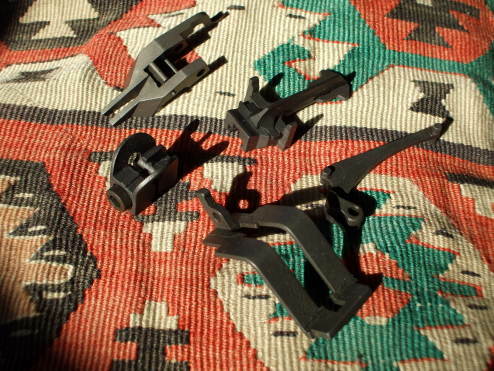 For example, the exploded view diagram refers to components of the rear sight as being parts of the front sight! Also, the discussion of Figures 8, 9, and 10A (further into the book, the figures in Chapter 1 aren't even numbered) is terribly confusing until you realize that those three figures are misnumbered. It is also poorly designed. Who would publish that type of book without an index? But it seems to be the best single source of information that's available. All the below details on type and manufacturer come from that book. Their book contains an appendix based on data from a series of books by Scott Duff, and that was used for the date references. Also see the spreadsheet a friend of mine constructed for recording and analyzing M1 Garand parts. Springfield Armory production, serial number 693,449, so it was manufactured during July 1942. Look at the drawing number stamped into the right side of the receiver. Drawing number 28291-17 stamped on right front leg of receiver, correct for serial number range 490,001 - 1,500,000. This suggests (or at least it does not disprove) that this is an intact receiver and not one reassembled from "de-milled" scraps. Here is a view into the receiver. 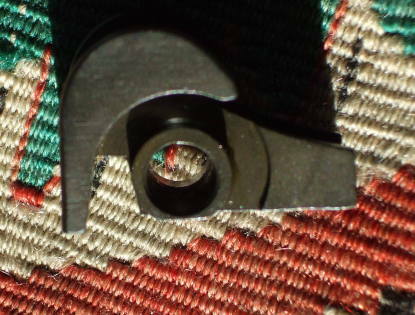 The ring of bright metal is the rear of the barrel and its chamber, the barrel has already been threaded into the receiver. 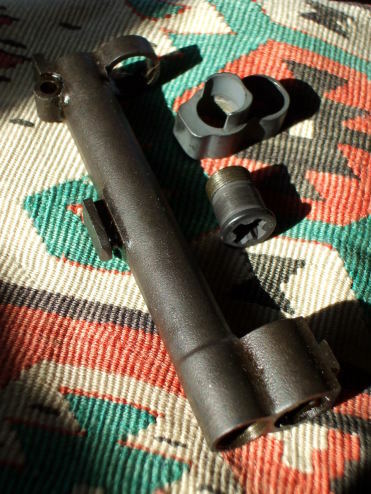 Also see the finish reaming section for a discussion of the chamber and how it was reamed to its final dimensions after the barrel was threaded into the receiver. There is a discussion of the steel used to make some of the M1 Garand receivers in Hatcher's Notebook, Julian S Hatcher, Major General, U.S. Army, retired, The Telegraph Press, 1947. Material: Early production: WD Steel No. 3115. 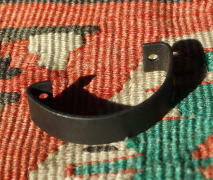 Material: Intermediate production: WD Steel No. 3120. Material: After July, 1942, WD No. 8620 Modified, same as for the bolt. Treatment: Carburize 0.012" to 0.018" at 1600° F.; oil quench temper 1 hour at 480°. Rockwell D 59 to D 67. 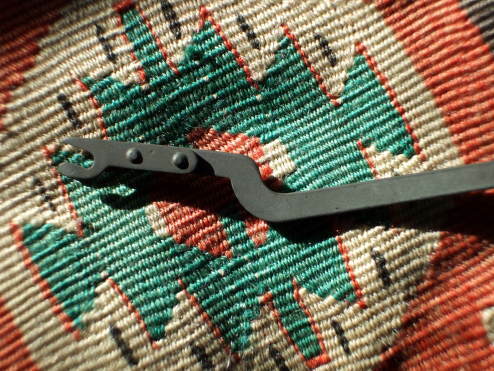 Manufactured by Springfield Armory (SA). Revision 18 means rifle serial number range 3,250,000 - 3,300,000, so it was manufactured during December 1944. A-4♦ is the steel heat treatment lot number. That last character is a diamond, in case your browser can't handle Unicode. 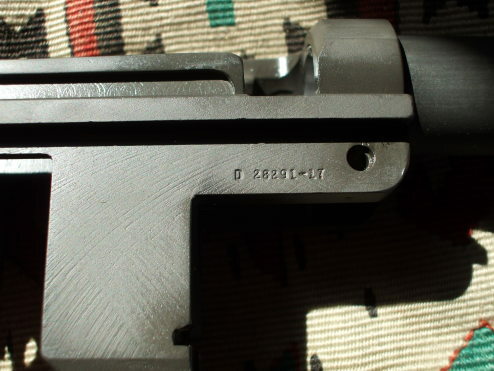 The indentation visible above the drawing number is a punch mark used to test the Rockwell Hardness during manufacturing quality control. Remember that the punch mark just means that it has been tested. It does not indicate the result of that test! But I would expect failed bolts to have been destroyed, the steel thrown back into the smelter for the next go-around during December 1944. The war was moving toward a fairly obvious conclusion then, but quality steel was still a valuable resource. If nothing else, failed bolts would surely be obviously marked or better yet destroyed ("de-militarized", or "de-milled") to prevent their accidental use. There is a discussion of the steel used to make some of the M1 Garand bolts in Hatcher's Notebook, Julian S Hatcher, Major General, U.S. Army, retired, The Telegraph Press, 1947. Material: (Prior to March, 1942) — WD Steel No. 3312. Material Authorized July 5, 1942, WD Steel No. 8620. Modified with composition as given above under M1903 rifle. Treatment: Normalize before machining. Carburize 0.015" to 0.020" at 1600° F.; oil quench. Temper 1 hour at 325°. Rockwell C 35 to C 59 on locking lugs and rear end of bolt. Square cut behind hole for elevation / windage shaft, so it's Type 2. 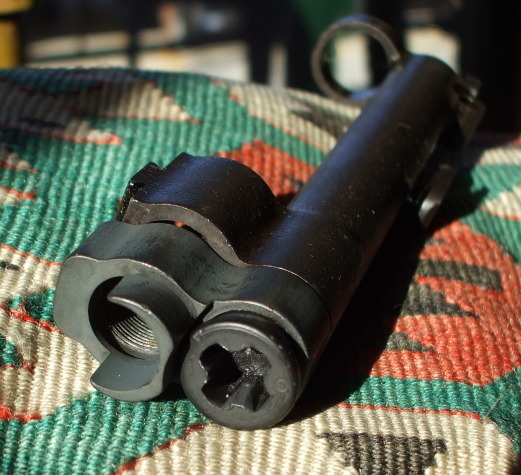 Type 2 rear sight bodies were used from around serial number 25,000 through the end of production, so any time after December 1939. 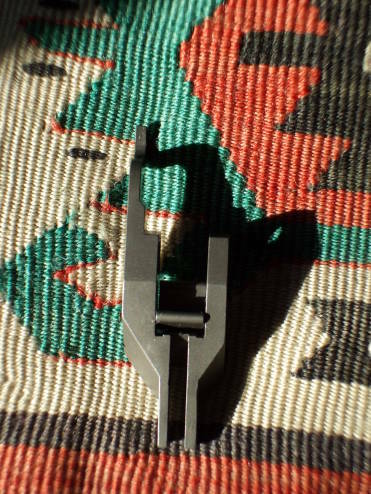 Manufactured by Springfield (closed arrowheads), Type 3 (captive flush nut, no spring). That means after approximate serial number 4,200,000, so post World War II. 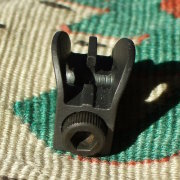 The WWII-era windage knobs used a relatively poor design with a "lock bar". 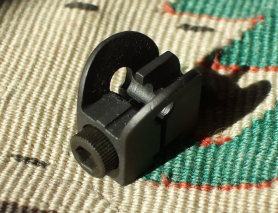 Each click changes the windage by just less than one minute of arc, or 0.96 inch at 100 yards, or 2.67 cm at 100 meters. Type 4 (elevation settings marked directly on knob, "2", "4", "6", "8", "10", and "12" indicating range in hundreds of yards. Using standard M2 Ball .30-06 ammunition, therefore standardized powder charge and bullet weight and aerodynamics, each click changes the elevation by one minute of arc, or 0.96 inch at 100 yards, or 2.67 cm at 100 meters. 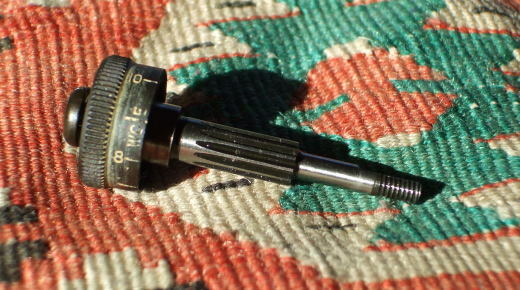 This specific design paired with the Springfield Type 3 windage knob is of post World War II manufacture. 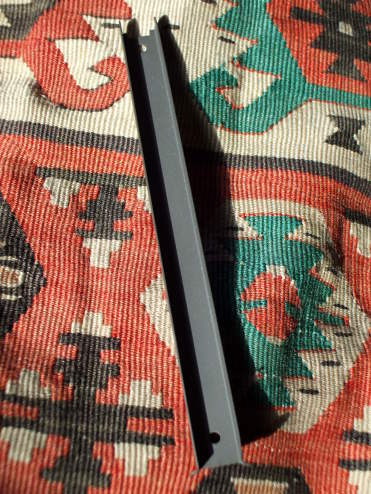 The operating rod was of Types 6A through 11 based on the squared straight-sided hump seen here. That plus the flat surface of the bolt lug housing seen above means it's Type 6A, so serial number range of approximately 3,450,001 - 3,850,000. So, it was manufactured some time January through June, 1945. 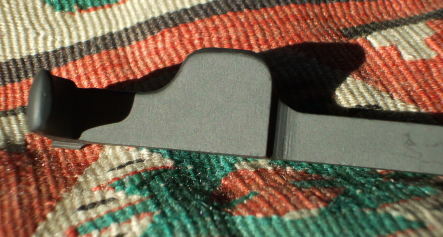 The rounded notch labeled here would have been done during post-WWII modification. This change from what was a square corner reduced stress. 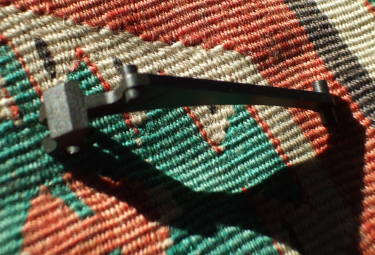 Type 5, based on riveted assembly, depth of notch, and lack of grooves. All IH and H&R and refurbishment (post-WWII). 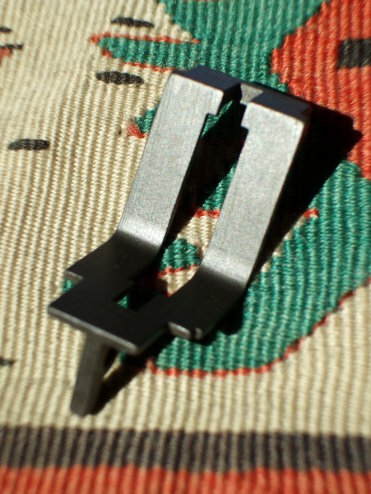 Type 2, forks (pointing down in picture) of slightly different width: 0.07" and 0.10". Manufactured after the change from Type 1 in late 1940 to early 1941. Type 4 based on the shape of its head, at left in this picture. Design used after approximate serial number 290,000, so manufactured after June 1941. 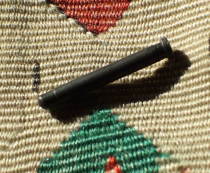 Type 2, narrower diameter at both ends of pin. 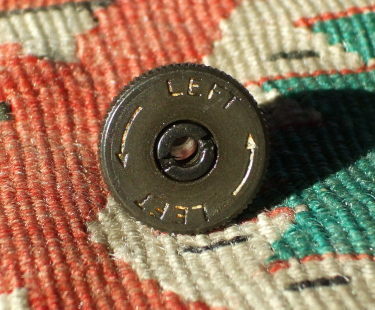 Design used by Springfield and Winchester during most of World War II. October 1943 through April 1945. 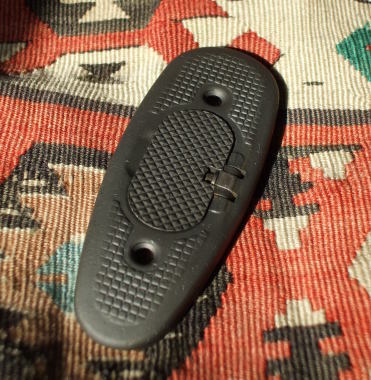 Stamped, no markings, wide slot, no notch on side. 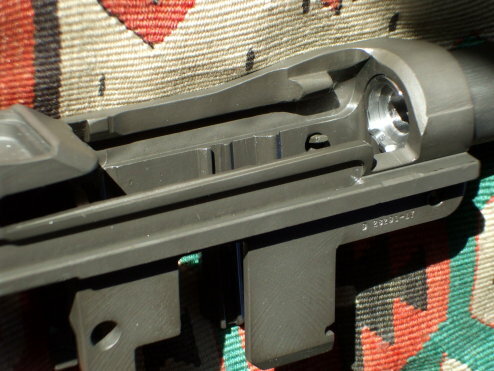 Trigger guard is Type 1 (milled). 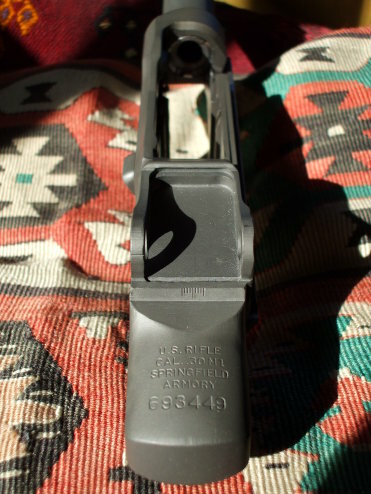 Specifically Type 1G — no diagram marking, but an inspector's initial stamp R. Manufactured by Springfield Armory. 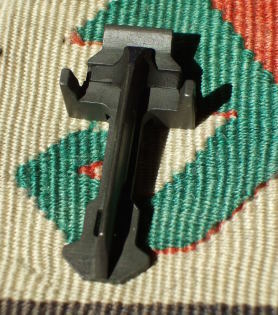 Trigger is Type 2 (no tooling hole). Manufactured by Springfield Armory. Serial numbers 80,000 to end of production, so any time after October 1940. Hammer spring plunger is Type 1, with protruding sides or guides. 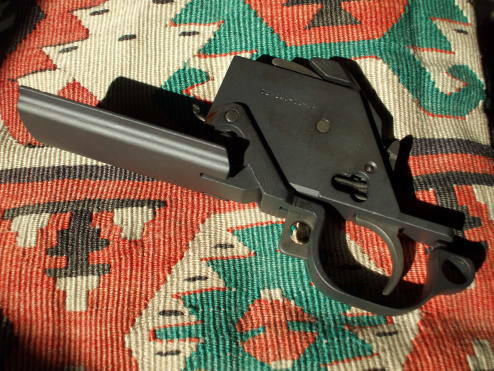 Manufactured by Springfield throughout World War II. Safety is marked SA-11, so it is Type 3C. Manufactured by Springfield Armory. Serial numbers 2,000,000 to end of production, so any time after September 1943. 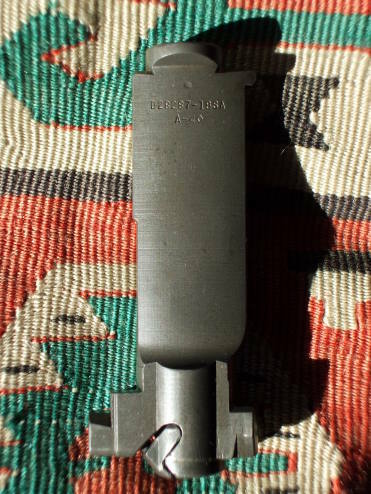 The gas cylinder is Type 2C (front sight base is 0.840" long and 0.575" wide) manufactured by Springfield Armory (flat top on rear ring). Serial numbers 1,600,000 through the end of production, so any time after April 1943. You may have noticed that the other parts were all parkerized, with a light grey matte finish. The gas cylinder looks rather different, with a color closer to black and a rough surface, looking almost greasy in places. The gas cylinder is made of stainless steel to withstand the high gas temperatures. This made for a fairly large and very reflective part near the muzzle. 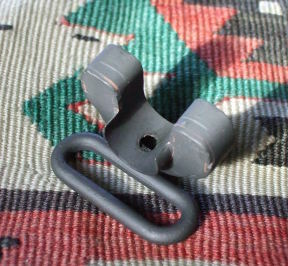 Chemical blackening can be used to greatly reduce the reflections from this part. This isn't a colored coating, like paint, but it is a chemical reaction that darkens stainless steel. Think about that: it changes the color of otherwise stainless steel. So yes, it involves some rather caustic chemicals. We used Caswell's stainless steel blackener. Back in the day, the men in the field re-blackened their gas cylinders from time to time using smoke from a campfire, a candle, or a trusty Zippo. The gas cylinder lock is Type 3A (front face not chamfered, 0.220" hump, no markings). Started at approximate serial number 4,200,000 through the end of production, so any time post-WWII. Gas cylinder lock screw is Type 3. 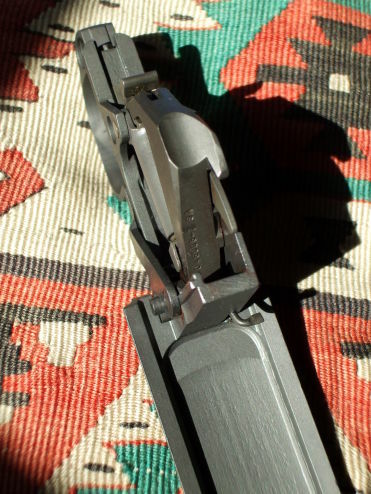 See marking O on its front face indicating manufacture by a subcontractor to Springfield Armory. Started at approximate serial number 2,500,000 through the end of production, so any time after December 1943. 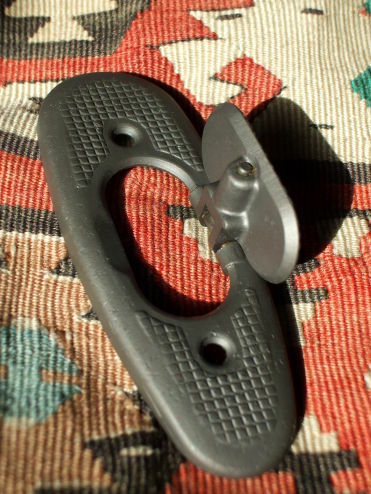 Type 3A, probably post-WWII manufacture by Springfield as it measures 0.670" across tops of guard blades. Type 2, 3rd variation (note the relatively large hole). Started at approximate serial number 510,000 through the end of production, so any time after February 1942. Type 2, with trap door. Manufactured by Harrington and Richardson, as the diameter of the countersinks is 0.300". So, post-WWII production. Type 3 (two holes, square notch in one end), so after serial number 50,000 and therefore any time after June 1940. Type 3, stamped sheet steel with no groove. This design was used starting around serial number 790,000, so it would have been manufactured any time after July 1942. There is a discussion of the steel used to make some of the original M1 Garand barrels in Hatcher's Notebook, Julian S Hatcher, Major General, U.S. Army, retired, The Telegraph Press, 1947. Yield Strength, 110,000 lbs. per sq. in. Elongation in 2 inches, 16% minimum. Reduction of area, 50% minimum. Brinell hardness, 269-311 (Equivalent to Rockwell C-28 to C-34). Process stress relief if required not less than 1 hour at 1000° F.